Multi-panel advanced polyamide fabric shell construction for durability and comfort. Compatible with Alpinestars’ class-leading Tech-Air™ airbag system. The garment is designed with stretch gussets on the arm and sleeves to accommodate jacket’s inflated volume without compromising seam strength or material integrity. The jacket’s ergonomic design means that it can be worn without the airbag system for a versatile, personalized fit. Multi-ventilation zippered openings on arms, back and the side of the body. Laminated DRYSTAR® membrane for waterproofing and breathability. The bonded membrane construction makes for lighter garment and reduced material bulk. Buckle waist adjustment for improved riding fit. Multiple volume adjusters on sleeves for improved fit and to avoid material bunching. Two front hand pockets, seamless chest and hands pockets with gusset and large back utility pocket for optimized storage of essential touring items. Two front chest pockets and inner waterproof pockets for safe storage of small belongings. New cuff adjustment closure system, features dual hook and loop grip strap securing system for rapid and personalized closure. Aramidic fiber reinforcement on elbows for durability, seam strength and abrasion resistance. Large stretch panel on the back of the shoulders and arms to increase flexibility and movement. Soft microfiber comfort edge on collar and cuffs. Chest pad and back compartments with PE padding (Alpinestars level 1 CE certified Nucleon chest and Level 2 CE certified back inserts available as accessory upgrade). Internal Level 2 CE-certified Bio Air shoulders and elbow protectors. Please use Alpinestars sizing chart for women to choose a size that best matches up with your measurements. For reference, our studio photos were taken with a size Large jacket on on our Fit Check mannequin Shirley. Laverne is a standard dress size 12. About sizing when accessory armor is used: I’d recommend you add 1” to your bust and waist measurements if you plan on adding the chest pads and the KR-1i back pad, which will be most peoples upgrade choice. If you want to add the KR-2I back pad, add 2”. The Tech-Air airbag system can be used with this jacket and would be used in place of the back pad and chest protectors. If selecting the air bag system, add 2” to your chest and belly measurements before selecting your jacket size. 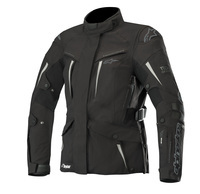 Alpinestars Yaguara Drystar jacket is a 3/4 length touring/adventure jacket with a host of armor choices and a very complete rainproofing and venting package. This is about as much tech as can be packed into one piece of riding gear! The waterproofing setup on this jacket is more advanced than most. It is a “bonded” construction jacket which means the waterproofing membrane is bonded to the back side of the textile shell material so the shell material and the waterproof membrane become one. Being bonded rather than having a separate waterproof liner behind the shell means that the water is blocked from passing through the outer shell and therefore the shell material does not become waterlogged in a rain. Also, with extensive zippered venting, the bonded waterproofing means that when the vents are open, the air coming through the vents goes right through to your body and is much more effective than jackets with a separate waterproof liner. So with the direct venting construction, this jacket will take you further into summer and still be reasonably comfortable. With all the zips closed and because the shell will be windproof as well as waterproof, this jacket will work well in cold temps too. You can layer underneath with your own thermal layers to get the insulation you need for conditions. A bonded and well vented jacket like this is about as close as you can come to a full four season design which is waterproof too. The armor system is where this jacket (and many other new styles for 2018) really shines. Firstly, you get level 2 CE-certified Bio Air shoulders and elbow protectors. These protectors are the highest rated and are as substantial of any armor we offer. This jacket also includes chest and back protection capability. There are two chest pad compartments in front and the traditional back pad compartment. The jacket comes standard with thin foam “place holder” armor pieces, but you can upgrade those with CE certified units (see the links below). Most will opt for the level one back pad although there is a level 2 back pad available as well. We’ve got good descriptions of both, so just click through the links to consider those options. The shoulder armor capability of this jacket is beefed up with external hard protectors on the outside of the shoulders. These protectors will add hard impact protection in that area. The elbows are reinforced with strips of Aramid strips (you can see those in the photos), which adds additional abrasion protection. As if that weren’t enough, this jacket is compatible with Alpinestars Tech-Air® street air bag system which is an optional air bag vest that is worn under the jacket and replaces the the optional armor mentioned above. MORE ON THIS OPTION LATER. Alpinestars says: Developed specifically for women and fully compatible with Alpinestars innovative active airbag technology Tech-Air®, the STELLA Yaguara DRYSTAR® Jacket features a laminated membrane construction for effective waterproofing and breathability without excessive material bulk. Convenient pocket storage options, strategic reinforcements and class-leading protection, inside and out, the STELLA Yaguara Jacket is fully featured for adventure touring.